Standing in Conway Square, this was originally the Market House for Newtownards. The market took place on the ground floor, the upper floors containing assembly rooms. The building saw action during the 1798 rebellion and was seized by the United Irishmen heading towards Saintfield; later rebels were held in cells below the Market House. By the end of the 19th Century the building was in use as a Town Hall. 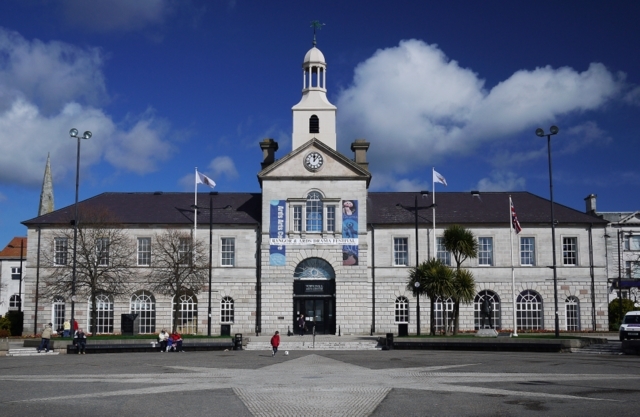 Today it is home to Ards Art Centre and hosts exhibitions and music recitals. Conway Square in the foreground still hosts a weekly market every Saturday. A flush bracket bench mark, numbered OSBM 3455, was located on the north-eastern tip of the building but this has been destroyed (probably during renovations c2002). This page has been viewed about 383 times.